Louise Bourgeois, The Damned, the Possessed, and the Beloved, 2007–10, aluminum, stainless steel, concrete, sand, fire. Installation view, Steilneset Memorial, Vardø, Norway, 2011. Photo: Guri Dahl. The witch trials, tortures, and executions that took place at Steilneset, on the island of Vardø, were inspired in part by a post-Reformation mania to impose Lutheranism as the state religion of the then-combined kingdom of Denmark-Norway, in part to assert the sovereignty of the aptly named King Christian IV, who wanted to rid his demesne of “ungodly persons” and impress upon Russiaon a clear day, just visible across a swath of the Barents Seathe presence on Vardø of a military fortress replete with troops and many cannon. The victims of the witch hunts were mainly women, many employed as domestic servants, though a fair number of men from the indigenous Sami people, long regarded throughout Europe as sorcerers adept at “wind magic,” met the same horrible fate. The Devil was believed to inhabit the far north and to pass into people by means of enchanted bread, direct satanic contact, or various spells and incantations. The possessed assumed the form of animals, caused storms at sea that threatened fishermen, made sheep and other livestock explode. They inflicted injuries and illnesses on neighbors. Everyday calamities were ascribed to the sinister workings of the Adversary and his largely penurious minions, who confessed they had been offered anything they wished for. The scope of their wishes seldom extended beyond the acquisition of a cow or a goat, but witches were witches and they all had to burn. As happened across Europe and in Massachusetts during this period, the accused, once denounced and put on trial, confessed under torture and implicated others, who were tried in turn. Guilt was established by tossing these hapless persons into the sea. Water was thought to repel evil. If they sank they were innocent, if they floated, guilty. An inquisitor was imported from Scotland, where witch hunts had enjoyed great success. Of the 135 people of Finnmark accused of witchcraft, two-thirds were condemned to death, the majority of them burned at the stake in Steilneset. Religious manias no longer feature in Norwegian life, unless you include the church burnings committed throughout the country by satanist death-metal cultists between 1992 and 1996. Poverty, which greatly factored into the witch huntsnot only in Norway but across Europe and colonial America as well; virtually no person of substantial wealth was ever burned as a witchis likewise not a big Norwegian problem at the present time. Thanks to North Sea oil, Norway is one of the world’s richest countries, and an underpopulated one. Its citizens enjoy the most generous social-welfare system to be found in Europe and probably anywhere else. 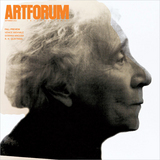 Norway currently invests millions in cultural and other projects in the public interest. 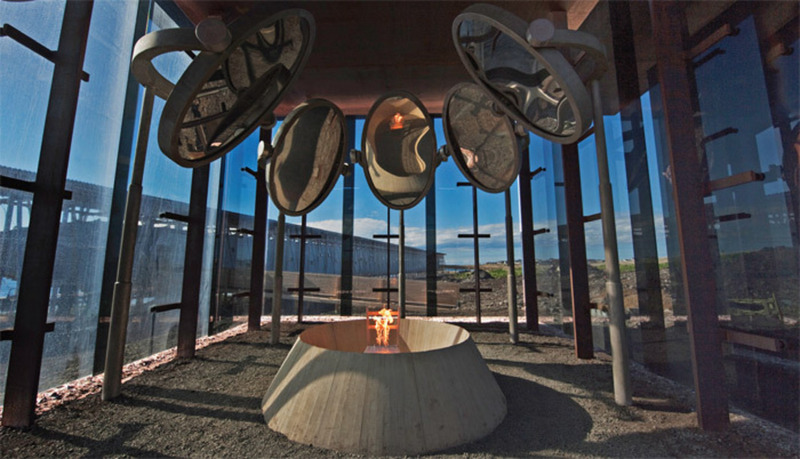 The witches memorial in Vardø is one of two hundred ventures designed to enliven Norway’s eighteen national tourist routes with structures and installations by architects and artists. These include rest areas, ferry landings, bridges for fishing, and hiking paths and lookouts sited in ravishing natural locations, of which Norway is unusually full. Vardø is more austere and desolate than beautiful, an outcrop of bleariness where the sun never sets through the summer and then disappears for the winter. There’s the frigid sea and endless sky and dark stunted hills across the water. That’s about it. Like much of Finnmark, Norway’s northernmost county, Vardø once flourished as a hub of the fishing industry. In recent decades, factory vessels depleted the catches. People migrated south to Oslo and Bergen. What remains are reindeer and sheepherders, a deliquescent service industry, people with second homes and others whose occupations one can only guess at. It would have made a perfect setting for a Chabrol film or a Simenon novel. While other completed tourist-route projects in Norway are elegant, utilitarian interventions into spectacular vistas, the Bourgeois-Zumthor collaboration has a different resonance of historical excavation. Public memorial objects often lack visual and tactile appeal and most frequently honor soldiers lost during wartime; the Vardø memorial is, by contrast, an active sensory experience, recalling an ignominious fold of history instead of a heroic onean improbable, cautionary monument to an abuse of power. The Steilneset Memorial occupies the same site where the Finnmark victims were incinerated, a quick walk from the Vardøhus fortress past the village church. It consists of two structures designed by Zumthor, one of which, the Glass Pavilion, houses Bourgeois’s installation The Damned, the Possessed, and the Beloved, 2007–10. The other, Memory Hall, is a lengthy enclosure shaped something like an anchovy fillet, supported by a complex pinewood frame inspired by the fish-drying racks that stand abandoned in nearby fields and farmyards. Its walls, white on the outside, consist of stiff fabric stretched by wires into a regular wavelike pattern, suggestive of a ship’s tethered sails. 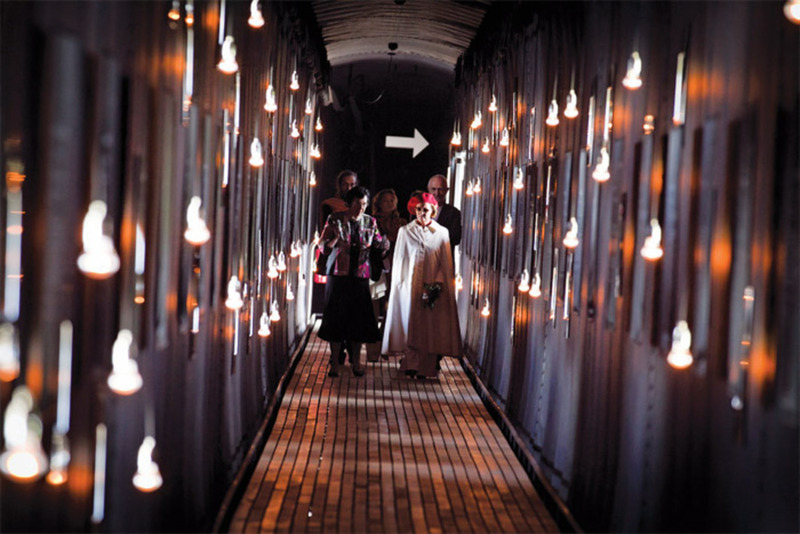 Queen Sonja of Norway (right) touring Peter Zumthor’s Memory Hall, Steilneset Memorial, Vardø, Norway, June 23, 2011. Photo: Heiko Junge/Corbis. Ninety-one small, square windows recessed in metal frames punctuate the walls at irregular heights determined by casting a die. Entered via a wooden ramp, the structure yields to the touchits inner walls are fabric, too, a black fiberglass textile coated in Teflonand it shudders in the wind. Each window represents a victim of the witch trials, identified, along with details of the individual’s ordeal, by a legend in white letters on a black-silk hanging plaque. Small, bell-shaped lightbulbs suspended in the windows give the long passage through the space a feeling of weightless movement along a torchlit corridor, a sensation enhanced by the raised catwalk underfoot. The effect of slightly altered gravity produced by the varying heights of the windows and lights, the elevated walkway, and the square, recessed views of the outer world suggests a theater in which the curtain is about to come up (or has just come down) on the bleak events described on the fabric plaques. The sensual immediacy of Zumthor’s materials is offset by an overall intellectual precision of design. The architect finds the cleanest, least obstreperous solutions to the shaping of spaces; the Vardø memorial has exactly enough solidity to occupy a stark, weather-ravaged coastal terrain without collapsing, like a small craft navigating a tempest. The long room ends at the door to an exit ramp. A few yards away, a cubical pavilion of black glass, like the dot at the end of an exclamation point, encloses Bourgeois’s installation, a terminus of high drama after the studied quiet of the larger building. The Damned, the Possessed, and the Beloved is an unforgettable vision in this ragged, elemental patch of ultima Thule. A steel chair, centered inside a thin, sloped ring of cementsomething like the mouth of a volcanoshoots perpetual flames from its seat. Seven huge oval mirrors, angled above the chair on slender pylons, twist the flames into sinister shapes, compress and bloat the cement and metal ensemble, and suggest the varied psychological distortions that spectacles like witch burning produce in their witnesses. The fire’s contorted reflections bring to mind the misshapen bodies in certain Francis Bacon paintings; the evocation of torture is immediate and unmistakable; the coils and stuttering tendrils of mirrored flame echo the shape-shifting transmigrations of humans into wolves and foxes and birds that the Vardø victims often confessed to. The chair as stand-in for a human figure, “viewed” by flanking or overhanging mirrors, appears in many late Bourgeois works, sometimes dwarfed by surrounding elements that transform it into an emblem of pathos and isolation, the individual misread by the eyes of others. Something stubborn and brave in this solitary being confounds its own powerlessness. It is, after all, the true subject of the work, the cynosure reached by an arduous spiral staircase or sealed under a bell jar, the thing reflected and pondered. The cage of social formsin this case a thicket of lethal demonological lawshas no meaning without the monadic subject trapped inside it. The Damned, the Possessed, and the Beloved is a fantastic restaging of the central drama in Bourgeois’s work: the plight and glory of the individual shaped and oppressed by the configurations of families and larger social structures. It bears witness to a wretched episode in human historyand, implicitly, to the myriad such episodes that have continued into the present, in various guises, in the name of various causes and gods and ideologies. In reenacting the repressed crimes that happened in Vardø, Bourgeois’s installation, coupled with Zumthor’s understated architecture, is a compelling plea for empathy with people destroyed by the fires of collective madness. Gary Indiana is currently at work on a memoir, I Slept with the Dead.